Keeping your hearing aids clean and treating them with care will help extend their life. Sooner or later all hearing aids will require repairs, and when they do House of Hearing can help. 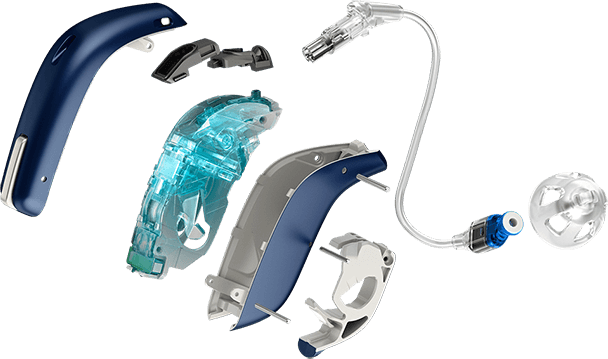 We service hearing aids 5 years and younger, whether they are in or out-of-warranty. It all depends on the condition of your hearing aid and what needs to be serviced/repaired. The most common type of repair for RIC hearing aids is a receiver change, which can in most cases be performed in-clinic. Prolonged exposure to moisture can also damage hearing aids, and it is therefore important that you keep them clean and dry at times of non-use. Hearing aid dry kits are specifically created for this purpose. It is also important to remove batteries when not in use as corroded batteries can cause serious damage to the internal circuitry. Most common signs of repair requirement are when feedback occurs, or when the aid won’t start even after changing batteries and replacing filters. If this is the situation you find yourself in, feel free to contact us at House of Hearing, we can help diagnose the issue and suggest best course of action.